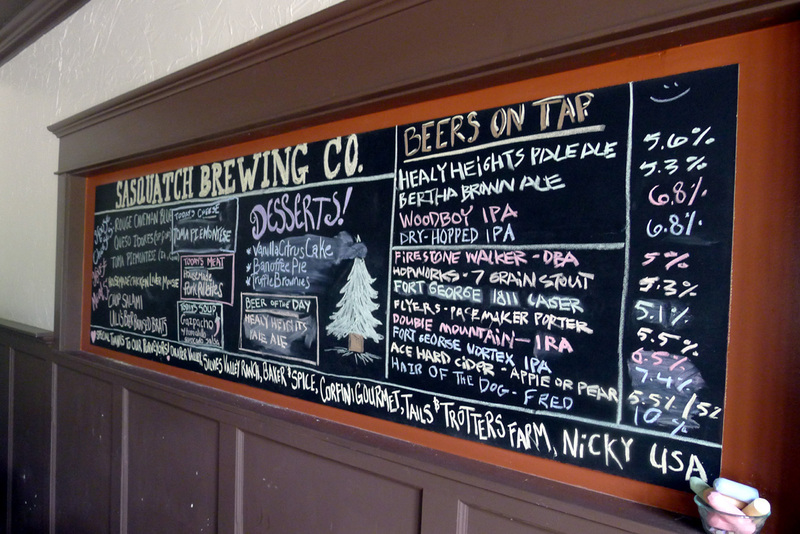 I'm not sure how often I've mentioned it, but Southwest Portland is very underserved in terms of beer and brewpubs. Common knowledge, really. 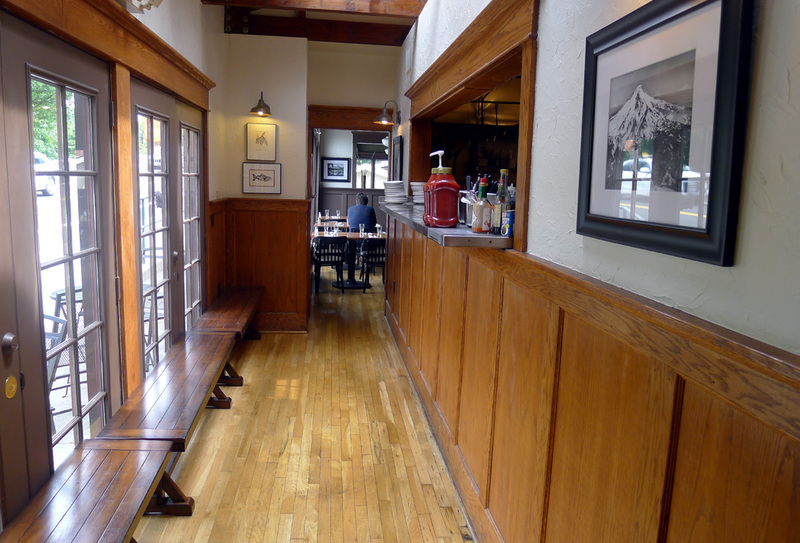 While Northeast and Southeast are packed with viable destinations, there are only a handful of places in Southwest...including the Raccoon Lodge, The Old Market Pub and the Hillsdale Brewery and Public House. 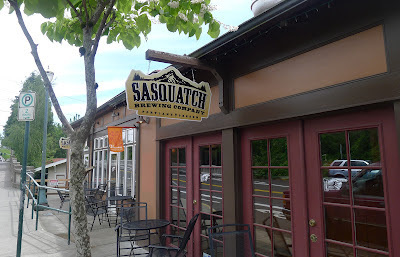 Sasquatch Brewing joined the Southwest club back in October, taking over the space previously occupied by Alba Osteria, an Italian restaurant, in Hillsdale. This is a bustling area. Owner and brewmaster Tom Sims ran into opposition from nearby residents, mainly having to do with noise, traffic and parking. The concerns were eventually minimized by way of a good neighbor agreement that allows ongoing dialogue. I'll get to the beers and pub momentarily, but I want to take a small detour to discuss what happened here. Sims lives in Hillsdale and wanted to open his business there. He tried like hell to find a space, but couldn't for many moons. He actually considered opening his brewpub in the St. Johns area. Then he got lucky. Alba Osteria vacated its space and he jumped on it. Sasquatch was born. There are certainly more than a few reasons why there aren't more breweries in Southwest, not the least of which is that there's no ready supply of cheap space. Seriously. One reason there are so many breweries in the old industrial parts of town (Northeast and Southeast) is that de-industrialization opened up cheap warehouse space there. (Northwest would be on this list, as well, except it has been overrun by high rises, condos and snarky businesses...which have combined to make space very expensive there.) Southwest has always been more of a residential area and never had the kind of industrial infrastructure that would have produced a lot of commercial space as the economy changed. Here's something else to think about. Look at the breweries that are located in Southwest. All of the ones that come easily to mind have locations on the Eastside. The Old Market Pub has the Broadway Grill and Brewery (a misnomer since they brew no beer there). the Raccoon Lodge has the Cascade Barrel House. The Hillsdale Public House, part of McMenamin's, has locations all over the map. There's a common theme here...which has something to do with the Eastside being prime beer space. But never mind. Okay...returning to the original story, the Sasquatch space is pleasant and comfy, though perhaps a little dysfunctional in terms of where the kitchen is located. It's nothing they can't work with. I suspect it gets fairly noisy in the pub when its crowded. They have limited outside seating along the sidewalk, and these tables will undoubtedly be popular in the warmer weather. Is it summer, yet? As for the beer, Sims shoehorned a 7 bbl brewing system with three fermenters into a back corner of the building. Pretty cramped space. Nearby, he has large serving tanks in a walk-in cooler...very handy since it allows you to serve your house beers without kegs. Local homebrewer Marc Martin is evidently supplying recipes and brewing guidance to Sims and assistant brewer Steve Neely. 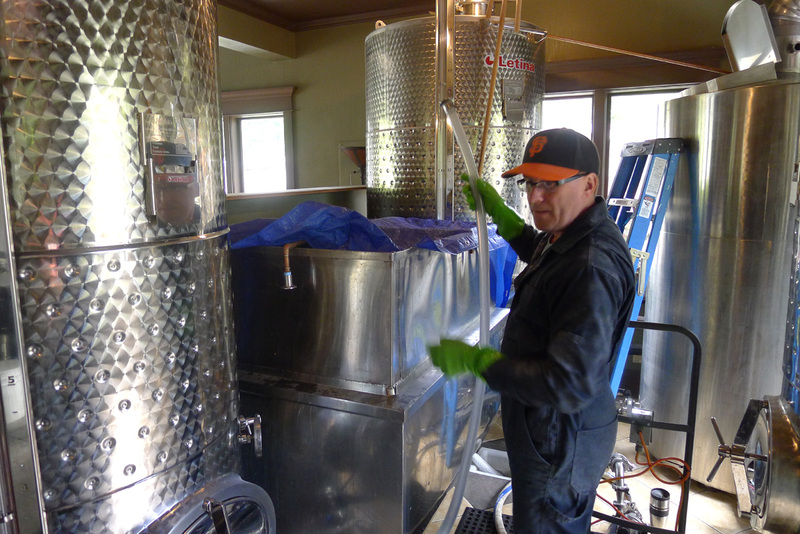 Brewing did not commence until February, Sims told me. No surprise there. Getting a brewery up and running involves navigating a maze of red tape, to say nothing of the logistics. Sasquatch poured guest beers from its taps until the in-house program got going. They had four house beers on tap when I visited...to go with six guest beers. More house beers are on the way, for sure. Alright, alright...the beers. 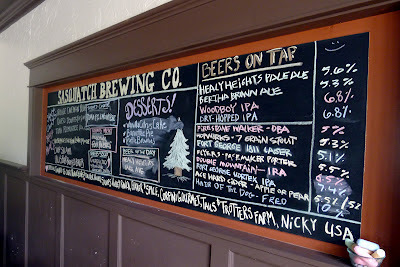 The four were: Healy Heights Pale Ale (5.6%, 46 IBU), Woodboy IPA (6.8%, 74 IBU) , Dry-Hopped IPA (6.8%, 74 IBU) and Bertha Brown Ale (5.3%, 37 IBU). Each beer presented well, with good color and creamy head. They use a mix of CO2 and Nitrous in their lines...I'm not aware of anyone else doing that locally, though I may just be unaware. Frankly, the beers were not particularly memorable. The Pale Ale is easily the best of the bunch, well balanced and a good example of the style. The IPAs both lacked substance. These are the same beer, by the way: Dry-Hopped IPA is simply dry-hopped Woodboy...thus the identical ABV and IBU values. Dry-Hopped IPA did not deliver the aroma or flavor I expect to see in this style. The Bertha Brown was pleasant enough, but seemed to have a slightly astringent aftertaste. My guess is these guys are still refining their recipes and brewing processes. I have to assume they will rectify the issues I perceived and get around to producing good beers. I'll be making another trip over there at some point to check on that. Meanwhile, the place is worth a visit. My lunch of fish (catfish in cornmeal batter) and chips was quite good, and really more than I needed to eat. The bottom line? 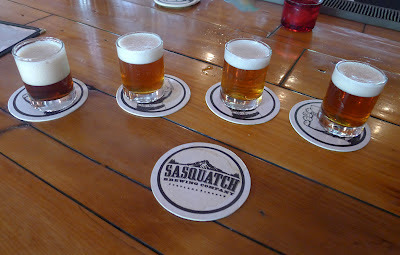 Sasquatch is a nice addition to the beer culture, particularly in an area that has limited choices. Folks in that area who don't want to drive across town now have another option. That's good news. Check it out.